The SOO Line is now part of the CN Railroad Systerm. Several pieces of equipment including a couple of steam locomotives have been preserved. 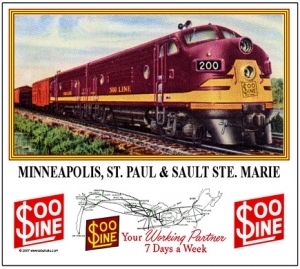 SOO Line GP30 number 700 is preserved at the Lake Superior Railroad Museum in Duluth, Minnesota. This great new t-shirt is available now. Same image as on the Soo mouse pad, this F-unit diesl mug is a beautiful sight to behold your coffee in. 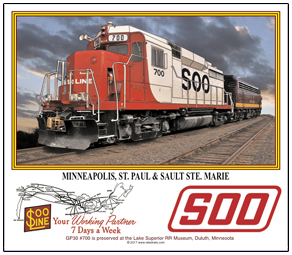 Coffee mug featuring the preserved and colorful SOO Line GP30 #700. 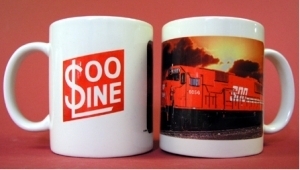 Beautiful SOO Line widebody diesel is imaged on this 11 oz coffee mug. One of the SOOs last diesels. Colorful SOO Line mouse pad with a beautiful F-unit diesel rolling through the Wisconsin country side. Colorful SOO Line mouse pad with a beautiful GP30 diesel. No 700 is preserved at the Lake Superior RR Museum in Duluth, MN. 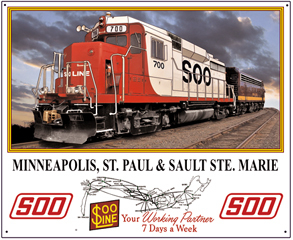 SOO Line map is featured below the diesel. 6 inch x 6 inch square tin sign of a logo used by the Soo Line Railroad in the late 1800s. 6 inch x 6 inch square tin SOO RRs Laker passenger train drumhead. 6 inch x 6 inch square tin SOO logo sign of the SOO Line Railroad. 6 inch x 6 inch square tin logo sign of the SOO Line Railroads Winnipeger passenger train. 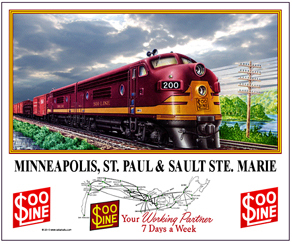 Historic colors found on the SOO Line F-unit diesels. Unique sign of a historic railroad locomotive. This is the large version of the small plack and features a system map and three logos. 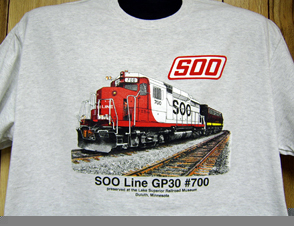 Colorful SOO Line GP30 diesel.